Honda String Trimmers and Stick-Edger offer the same advantages as the rest of Honda’s Lawn and Garden products thanks to four stroke engine technology. Both products are highly fuel-efficient and use regular gas. That means there’s no mixing of gas and oil! They run clean and quiet and exceed all EPA and CARB emission standards. They also have the unique advantage of having 360º engines: they can be used and rotated in any position. Honda 4-stroke grass and weed trimmers set the standard for trimmer efficiency and reliability. Both the String Trimmer and the Stick-Edger are terrific tools for making pleasant and quick work of the job at hand. 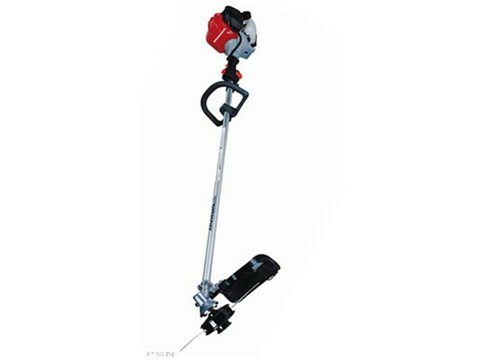 Following is a description of each Honda grass and weed trimmer, as well as the Honda Stick-Edger. Honda string trimmers are designed to take on thick grass and heavy brush without bogging down. The excellent balance, feel and low noise of these trimmers makes them easy to hold and work with. Honda trimmers and stick edgers offer homeowners and professional landscapers a pleasant alternative to traditional 2-stroke handheld equipment. Equipped with Honda’s high efficiency, mini 4-stroke engine, these products deliver both power and quiet operation for a more pleasant operating experience and top notch results. Honda Mini 4-stroke engine Powerful Honda mini 4-stroke engine for excellent torque and fuel efficiency. Incredibly quiet and virtually smoke-free. No need to mix oil and gas. Runs on regular gasoline. All Honda engines meet EPA and CARB emission levels. Loop handle For comfort and ease, Honda offers loop handles.